HARTFORD _ Her efficiency in the midst of chaos is amazing. There are moments in women’s college basketball with balls caroming off rims and bodies caroming off each other when the game can make little sense. And then there is Napheesa. Napheesa Collier’s game always makes sense. She calms seas. She stills the blustery wind. She isn’t the biggest talker in the world and maybe that’s fitting, because nobody can quiet the loud, ugly turns of a game like Collier. Inside the lane? She has a nose for the basket as if she owns some giant GPS magnet. She banks shots, plays angles like she is Isosceles in Nikes. The No. 4 Huskies did what they always do against No. 11 South Carolina on Monday night in the XL Center. They won. They won 97-79 because of a devastating third quarter where they outscored the Gamecocks, 29-12. They won because freshman Christyn Williams played one of her best games since that Big Wow at Notre Dame. They won because Katie Lou Samuelson heated up for 29 points. But, mostly, they won because of Collier and the sort of ultra-efficient stat line that makes you wonder if she even has a pulse. “No, I don’t think she does,” coach Geno Auriemma said. Collier’s stat line screamed efficiency: 15-for-23, 16 rebounds, six assists, zero turnovers. Her 31 points were a season high. Her 16 rebounds were one shy of the career high she grabbed at Oklahoma in December. She does this without needless on-court flair and without any off-court drama. She is more calculating than an actuary. We can’t say this for absolute fact, but chances are good she can stop earthquakes or at least social media drama. At this point, Auriemma was warming up for some superlatives. It’s clear. She isn’t Diana Taurasi. She isn’t Breanna Stewart. She isn’t Maya Moore. And without transcendent games in the losses at Baylor and Louisville, it’s tough to come out and say she’s college player of the year. But she’s in the top handful for sure and he had a point to make. Dawn Staley has figured out how to win a national championship. She has not figured out how to beat UConn. 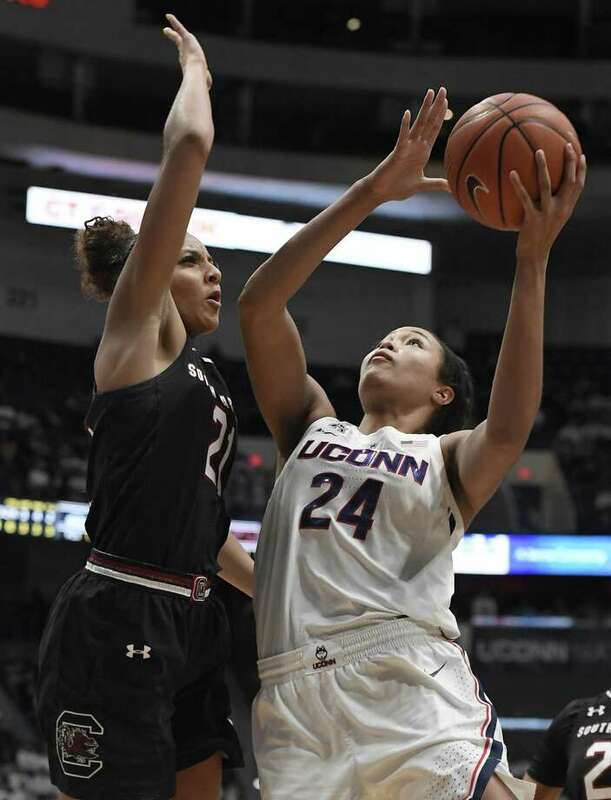 South Carolina has played UConn when the Huskies were No. 1 in the nation. 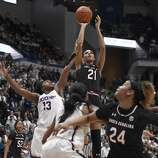 South Carolina has played UConn when the Gamecocks were No. 1 in the nation. Played the Huskies in Columbia, Storrs, Albany in the NCAA Tournament, and now Hartford. They’ve played UConn eight times and are 0-8. Hasn’t mattered when, where or who has been on the court. Breanna or A’ja Wilson. That has to be frustrating for Staley. Collier doesn’t make it any less so. Yet Staley also has coached Collier on national teams. She loves her game. Collier has loved playing for Staley. South Carolina hit 10 of its first 11 shots on this night. The Huskies changed defenses. They played zone. Junked it up, to use Staley’s term. They kept trying stuff until it worked. At halftime, Collier said, it was emphasized to force the Gamecocks to the middle and bring them to the help and make it more congested. UConn blew open a 44-43 halftime lead in the third quarter. The Huskies didn’t make those shots in losses at Baylor and at Louisville. They made them Monday night in the decisive, dramatic third quarter. They essentially finished USC off with five starters and Olivia Nelson-Ododa playing nine minutes. Auriemma says he doesn’t worry about his starting five physically. He worries about them mentally. Yes, he is disappointed he hasn’t found a way to incorporate more minutes from the bench, but that’s life in the 2018-2019 season. “That’s why our starting five has to be on the same page and locked in,” Collier said. For a time, Auriemma insisted, Williams thought about playing instead of playing, didn’t trust her instincts. From the start, Collier trusted her own. Find the angle to the basket. Find the most efficient shot. Yet quietly, she has expanded her game. Look at the last four outings. She has 17 assists and one turnover. On a night like this she hit mid-range shots that aren’t always easy to make. Look, if anybody thinks the Huskies are going to become a great lock-down defensive team, it’s not happening. If anybody thinks Auriemma is suddenly going to start going 8-9 deep, forget about it. He laughs, says his starting five players are smart. As long as they play hard, they’ve figured out they aren’t going to get benched. After the losses to Baylor and Louisville it was important that the Huskies come out of this night feeling good about themselves. They do. If the season ended today, the NCAA announced Monday night the Huskies would be a No. 2 seed in Albany behind Mississippi State. You know what? That’s fine. That’s nothing to get all worked up about, Husky fans. That’s nothing to let the old blood pressure go through the roof. Napheesa’s taking it in stride. No, there is no blustery wind when Napheesa Collier opens her mouth. Yes, the seas calm when she takes the court.